Region: Donetsk Airport. Verified data on the losses in the units of the 5th Tank Brigade of 36th OF VVO: “Cargo 200” – 8, “Cargo 300” – 11. Four armoured vehicles – compromised. Region: Donetsk Airport. Verified data on the losses in the units of the 331st Parachute Regiment of the 98th Airborne Division of the RF: “Cargo 200” – 38 “Cargo 300” – 42, missing – 5. Region: Donetsk Airport. Verified data on the losses in the units of the 22nd separate brigade of the GRU Parachute military intelligence of the RF (military unit 11659, Rostov region): “Cargo 200” – 12, “Cargo 300” – 25, missing – 1. Region: Donetsk airport. Verified data on the losses of 234 Airborne Assault Regiment, 76th Division: “Cargo 200” – 53, “Cargo 300” – 71, missing – 6. Region: Dokuchaevsk. Division 108 of the Mountain Assault Regiment (*Maikop Guards Mountain Assault Kuban Cossack Order Red Star regiment), in combat missions: “Cargo 200” – 2, “Cargo 300” – 15 (6 seriously). Region: Donetsk airport. Verified data on the losses of reconnaissance unit of 175th separate reconnaissance platoon, 76th Assault Division: “Cargo 200” – 21. Region: Debaltsevo. Units of the 32nd Motorized Rifle Brigade, Central military District (* 22316 military unit, location – Shilovo, Novosibirsk Oblast) as a result of Ukrainian artillery strike: “Cargo 200” – 3, “Cargo 300” – 5. Region: Donetsk airport. Consolidated group of units of 331st Parachute Regiment of the 98th Airborne Division of the RF and 22nd Separate Brigade of GRU Russian Military Intelligence (*military unit 11659, Rostov region), while on the mission, was fired at by Ukrainian artillery. Losses are being clarified. Region: Donetsk airport. Preliminary data on losses of 234 Airborne Assault Regiment, 76th Division: “Cargo 200” – 38, “Cargo 300” – 61, missing – 35. The unit moved away from the contact line for restaffing. Region: Donetsk Airport. Units of the 5th Tank Brigade of the 36th OF VVO shelled with high power rocket and artillery fire. The losses are being clarified. Region: Donetsk Airport. Units of the 234th Airborne Assault Regiment of 76th Assault Division again shelled by dense fire of Ukrainian artillery and began unauthorized retreat. The losses are being clarified. Its place will be taken by the units of the 5th Tank Brigade of 36th OF VVO. Region: Donetsk airport. Units of the 175th separate reconnaissance platoon of 76 Assault Division while on the mission entered the non-detonated zone of the minefield. Were discovered and carpeted with heavy machine guns. Communication with the unit broken down. Region: Donetsk Airport. Request urgent removal of the units of 234rd Airborne Assault Regiment of 76th Assault Division from the line of contact and rotation with arriving units. The losses are being clarified. Region: Lugansk. Units of the 104th Airborne Assault Regiment of 76th Assault Division during the march have been attacked with small arms and rocket-propelled grenades. “Cargo 200” -2, “Cargo 300” – 9. Loss of armored vehicles – 2 units. Region: Elenovka. Units of 288th Artillery Brigade of 20th OA ZVO during the planned rotation received Ukrainian artillery and missile strike. “Cargo 200” – 6, “Cargo 300” – 20. Request permission to withdraw units from the line of fire contact. The situation is aggravated by practically full elimination of the militants holding the position in the area. Region: Lugansk. Ukrainian missile strikes units of the 22nd separate brigade of the GRU (Russian military intelligence, military unit 11659, Rostov region). There is a partial collapse of the building – the place of the dislocation. The losses are being clarified. Region: Donetsk airport. Verified data on the losses of consolidated shock battalion of Chechen Interior Ministry “Cargo 200” – 18, “Cargo 300” – 5, missing – 10 captured – 2 (confirmed). Region: Donetsk. Accident. Hereby bringing to your attention that as a result of a quarrel on the basis of hostile personal relations, an officer of consolidated shock battalion of Chechen Interior Ministry used personal weapon to shoot an officer of 31st Guards Airborne Battallion. Requesting the order for immediate redeployment of the consolidated shock battalion of Chechen Interior Ministry. Region: Donetsk Airport. Units of the 5th Tank Brigade of 36th OF VVO (* military unit 46108, Ulan-Ude), in combat missions “Cargo 200” – -2, “Cargo 300” – 4. Tank losses — 1 unit. Region: Donetsk Airport. Units of 31th Guards Airborne Division (military unit 73612, Ulyanovsk) in combat missions, “Cargo 200″ – 12, “Cargo 300” – 31. Region: Donetsk Airport. Units of consolidated shock batallion of Chechen Interior Ministryб in combat missionsб “Cargo 200” – -3, “Cargo 300” – 5, missing – 27. The batallion left the zone of contact without authorization and moved to the second line of dislocation. Location of the unit commander is being established. Region:Schastie. Consolidated group of units of the 32nd Motorised Rifle Brigade (military unit 22316, Novosibirsk region), the 107th MIA Brigade (*Vladivostok), the 175th separate reconnaissance platoon while moving to the positions were attacked by a mobile unit of Ukrainian military. “Cargo 200” – 10, “Cargo 300” – 14 missing – 1. Region: Debaltsevo. While on the missions, units of the 13th Guards Tank Regiment (* Naro-Fominsk) and 37th Separate Motorised Rifle Brigade “Cargo 200” – 12, “Cargo 300” – 22, missing -2. Region: Horlovka. 67th Air Defense Artillery Brigade, in combat missions, retaliatory Ukrainian artillery fire APU “Cargo 300” – 6, missing – 1. Region: Donetsk. Missile attack (possibly with the use of precision weapons) at the location of 282nd weapons repair base (*Voronezh region). Destroyed part of the production facilities and equipment. The damage is being assessed. “Cargo 300” – 4, missing – 1. Region: Nikolaevka. Loss of units of the 6th Tank Brigade and the 74th Separate Guards Motorised Brigade: “Cargo 200” – 5, “Cargo 300” – 31 (7 seriously). Destroyed 2 tanks, 1 SP artillery mount and 1 BMP . Region: Donetsk. Losses in units of the 61st Marine Brigade of Russia’s Northern Fleet (*Pechenga (Fin. Petsamo) village and Sputnik town, Murmansk region) and Reconnaissance group of 104 Airborne Assault Regiment, 76 Airborne Assault Division (*Pskov, Russia): “Cargo 200” – 5, “Cargo 300” – 15. Region: Donetsk airport. Counter-battery dense fire, units of 232nd Rocket Artillery Brigade of 41st Central military District (*Irkutsk region, military unit 31643) “Cargo 200” – 9, “Cargo 300” – 8. Потери л\с подразделений 61-й бригады морской пехоты СФ РФ (*н.п Печенга(фин. Петсамо) и Спутник, Мурманская область) и РТГ 104 десантно-штурмового полка 76 дшд ВДВ (*г.Псков РФ) are being clarified. According to intercept, Ukrainian forces losses at the airport amount to: “Cargo 200” – 6, “Cargo 300” – 14. Region: near Nikolaevka village. Breakthrough of the Ukrainian tank group of 11 tanks (3 “Oplot” tanks), 6 SP artillery mounts, 10 armoured cars and 6 APCs was stopped at the distance of 2 km from the village by the units of the 6th Tank Brigade and the 74th Separate Guards Motorised Rifle Brigade. Enemy lost 1 tank and 2 armored cars. The situation is complicated by the mass desertion of the militia units. The losses are being clarified. Region: Donetsk. High-precision missile strike carpeted missiles precision the location of the unit 1020, GRU Russian military intelligence (*Vatutinki, somewhat specific unit for reconnaissance tasks: communication, radar, intercept bearing, etc.) located directly in the city. After the missile strike the unit was attacked by Ukrainian reconnaissance group with small arms and rocket-propelled grenades. All equipment (14 units) completely destroyed. Duty personnel have died. Location of the unit commander is being established. The losses are being clarified. Region: Veselaya Gora. High-density rocket and artillery fire carpeted the dislocation of 5th Tank Brigade, 36th OF VVO (*military base 46108, Ulan-Ude), and the 28th Motorized Rifle Brigade CVO (* Yekaterinburg). Losses are being clarified. The use of tactical aircraft by Ukrainian side is not confirmed. Region: Donetsk. 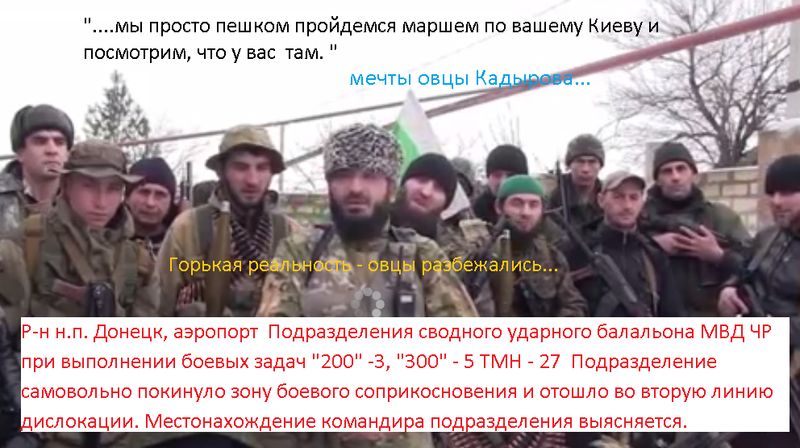 As a result of the conflict between soldiers of 8th Separate Mountain Infantry Brigade (* Chechnya, Borzoi village) and militia units: “Cargo 200” – 1, “Cargo 300” – 2. Region: Schastie. Reconnaissance unit of 107th MIA Brigade (*Vladivostok) during the retreat after a successful mission received fire from a high power sniper weapon. “Cargo 200” – 3, “Cargo 300” – 4. (2 seriously). We draw your attention to presence in the area of unidentified Ukrainian armed special forces armed with a non-standard high power weapon. Region: Lugansk. During the assault on the marked location (the base of the 2nd Battalion, 4th Brigade, LNR Defense Ministry) by the units of 22th separate brigade of the GRU (Russian military intelligence (*Rostov region): “Cargo 300” – 2. Some of the persons present there have been arrested and handed over to representatives of the LNR Prosecutor’s Office. Large part managed to escape. Ammunition and weapons have been removed from the location. Region: Dokuchaevsk. While on scheduled move, a unit of 13th Guards Tank Regiment (military unit 32010, Naro-Fominsk) came under friendly fire of militia’s artillery. “Cargo 200” – 1, “Cargo 300” – 5. 2 tanks – destroyed. Towing impossible, equipment was abandoned and captured by Ukrainian units. Please note that the militia units were aware of the convoy movement but still opened fire. Region: Granitne. Losses in 108 Mountain Assault Regiment (*Novorossiysk) “Cargo 200” – 19, “Cargo 300” – 36. Region: Granitne. While on scheduled move, a convoy of the units of 108th Mountain Assault Regiment (*Novorossiysk) was attacked by Ukrainian reconnaissance group. As a result of landmine blast, truck with unit’s personnel has been completely destroyed. The losses are being clarified. Region: Luganskaya Stanitsa village. Units of 385th Artillery Brigade, 2nd ACVO, in the process of deployment and rotation of militia artillery units, as a result of Ukrainian artillery and rocket fire APU, “Cargo 200” – 2, “Cargo 300” – 6. Due to complete inefficiency of the militia artillery crews, ask relocation of additional forces for covering all sectors of defense. Region: Granite (Mariupol ON). While on the missions, units of the 200th Artillery Brigade received, as a result of retaliatory Ukrainian artillery and rocket fire: “Cargo 200” – 1, “Cargo 300″ – 4. We confirm the use of RQ-11B Raven drones by the Ukrainians. Region: Lugansk. One of the experts of military unit 88612 has returned to dislocation after, according to him, an unauthorized absence. According to his testimony, personnel of the unit is engaged in a protracted conflict with the militia units. The data is being clarified. Region: Lugansk. While on the missions (*surrounded the base perimeter of the 2nd Battalion, 4th Brigade of the LNR Defense Ministry), units of the RF MIA 17th Special Forces (*”Edelweiss”, Mineralnye Vody): “Cargo 300” – 3. Region: Lugansk. In the dislocation zone, unidentified persons attacked experts of the military unit 88612 (*Saratov’s 1000th Training Center for combat use of missile troops and Land Forces artillery): “Cargo 200” – 18, “Cargo 300” – 2 (both in critical condition), missing – 2. All wounds inflicted by a cutting weapon. The circumstances of the incident are being clarified. Search for missing persons is under way. Mariupol ON. While on intelligence missions, special team of the military unit 90091 (*54th Intelligence Units Training Center, Vladikavkaz): “Cargo 200” – 1, “Cargo 300” – 2. Region: Donetsk. While complying to the order of returning to the place of permanent deployment, units of the 4th Separate Guards Kantemirovsky Tank Brigade, units of the 200th Special Ops Brigade (*Rostov) came under fire of Ukrainian heavy mortar unit. “Cargo 300” – 8. Region: Dokuchaevsk. Logistics and mining means warehouse of 31st Engineering Regiment have been blown up. The damage is being assessed. “Cargo 200” – 2, “Cargo 300” – 9, missing – 1. Region: Donetsk. While moving the deployment area, units of motorized infantry battalion and a tank platoon of the 4th Separate Guards Kantemirovsky Tank Brigade came under targeted fire of Ukrainian tank unit of 3 tanks (2 have been identified as “Oplot”) and two APCs with anti-tank arms. 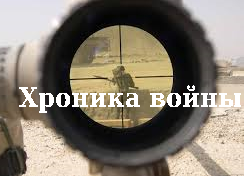 Return fire was opened, Ukrainian units retreated without taking the fight. “Cargo 200” – 10, “Cargo 300” – 12. Disabled: 2 tanks, 1 – beyond repair. Region: Donetsk. Verified data on the losses of the units of 61st Marine Brigade, Russia’s Northern Fleet, and the Reconnaissance Group of 104 Airborne Assault Regiment, 76 Russian Airborne Division: “Cargo 200” – 18, “Cargo 300” – 29, missing – 3. Death of the Reconnaissance Group commander has not been confirmed. Region: Donetsk. While moving to dislocation, units of the 61st Marine Brigade of Russia’s Northern Fleet (*Pechenga (Fin. Petsamo) village and Sputnik town, Murmansk region) and Reconnaissance group of 104 Airborne Assault Regiment, 76 Airborne Assault Division (*Pskov, Russia) came under fire. The area was carpeted by high power artillery and mortar fire. The losses are being clarified. Region: Donetsk. Reserve dislocation of the 35th Administration Brigade, 41st OA Central military District, came under fire by artillery and mortars: “Cargo-200” – 2,” Cargo 300 “- 11. Region: Stakhanov. While on the missions, 107th MIA Brigade (*Vladivostok): “Cargo 200” – 1, “Cargo 300” – 3. Region: Donetsk. Rocket-propelled grenades and small arms fired at dislocation of the 35th Administration Brigade, 41st OA Central military District: “Cargo 200” – 1, “Cargo 300” – 3. Region: Donetsk. During an attempt of unauthorized departure from the location of the 35th Administration Brigade, 41st OA Central military District, a collision with fuel truck resulted in explosion. Circumstances are being investigated. “Cargo 200” – 2, “Cargo 300” – 4. Region: Donetsk. 232nd Rocket Artillery Brigade, 41 OA Central military District (*Irkutsk region, military unit 31643), while on the missions, Ukrainian artillery strike resulted in “Cargo 200” – 1, “Cargo 300” – 2. Region: Makeevka. Unknown persons blew up the ammunition warehouse of the 8th Separate Mountain Motorised Rifle Brigade, Southern Military District (*Chechnya, Borzoi village): “Cargo 300” – 6. Region: Donetsk. While on the missions, units of the 13th Guards Tank Regiment (* Naro-Fominsk): “Cargo 200” – 2, “Cargo 300” – 4. Damages – 1 tank beyond repair. Region: Starobeshevo. “Carnation” SP artillery mount unit of the 33rd Motorized Rifle Brigade (*Maikop) while on a combat mission was attacked by Ukrainian special ops team: “Cargo 200” – 2, “Cargo 300” – 5. Ammunition has been destroyed. Region: Donetsk. Losses in units of the 61st Marine Brigade of Russia’s Northern Fleet (*Pechenga (Fin. Petsamo) village and Sputnik town, Murmansk region) while moving to a new location, blown up on a radio-controlled heavy landmine: “Cargo 200” – 4, “Cargo 300” – 9. SChV-3 (*SChV = urgent, extraordinary, report level 3). Please be advised that the region of Lisicansk. While on special mission, a group of experts from military unit 35690 (*FSB Special Operations Center) has disappeared. The group included deputy Head of Staff of the military unit. Measures are taken to identify the causes. Region: Yenakievo. Reconnaissance Artillery Battalion of 200th Artillery Brigade, Zabaikalsky Military District during operational deployment was attacked by sniper fire: “Cargo 200” – 1, “Cargo 300” – 1. Region: Yenakievo. Combat Support Unit of the 200th Artillery Brigade, Zabaikalsky Military District, while passing through the territory of a residential enclave, has been attacked twice with small arms and rocket-propelled grenades. “Cargo 300” – 3. Region: Schastie. While on the missions, units of 107th MIA Brigade (*Vladivostok): “Cargo 200” – 2, “Cargo 300” – 4. Region: Debaltsevo. While on the missions, units of the 13th Guards Tank Regiment (*Naro-Fominsk): “Cargo 200” – 1, “Cargo 300” – 2. Mariupol ON. Region: Shyrokyno. While exiting the combat mission zone, a Special Ops group of the military unit 90091 (*54th Intelligence Units Training Center, Vladikavkaz), under unexplained circumstances: “Cargo 200” – 4, “Cargo 300” – 1 (seriously). The commander of the group was identified among the dead. Circumstances of the death are being investigated. Region: Donetsk. Verified data on the losses of 104 Airborne Assault Regiment, 76th Division (Pskov city): “Cargo 200” – 16, “Cargo 300” – 30, missing – 12. Region: Donetsk. At your request here are the details of the incident. 2nd reconnaissance group of the 104th Airborne Assault Regiment, 76 Airborne Assault Division (*Pskov) as a part of 87th team was moved to the region of Donetsk airport to cover the retreat of units from the direct contact areas. The movement was done on four “KAMAZ” trucks escorted by 2 APCs. On arrival to the place of deployment, Ukrainian artillery positions were shelled by three mortar points of unknown affiliation, from the defence zone controlled by the militias. As a result of retaliatory fire, the place of deployment of 2nd Reconnaissance group of the 104 Airborne Assault Regiment, 76 Airborne Assault Division, came under heavy-duty artillery and mortar fire. Units of Ukrainian started moving 4-5 combat groups to the location. To prevent entrapment and complete destruction, Russian military personnel had to retreat inland for about 3 km. The death of the commander of the 2nd Reconnaissance group of 104 Airborne Assault Regiment, 76 Airborne Assault Division is confirmed. Data on personnel losses are being clarified.